Former Vernon city official Eric T. Fresch, whose financial dealings were at the center of a major state audit, was found dead June 28 at a state park in Northern California. His body was found on the shore of a rocky beach on the east side of Angel Island State Park, said Tiburon Fire Department Battalion Chief Ed Lynch. Fresch was 58 and a resident of Tiburon. Park officials received a report early that Thursday afternoon that Fresch had missed two scheduled ferries back to Tiburon. Park superintendent, Amy Brees, said they conducted a search. At 6pm, they found Fresch’s bike, which led them to his body. According to Keith Boyd of the Coroner’s division of the Tiburon Sheriff’s Department, it could be weeks before the cause of Fresch’s death is determined. The news of Fresch’s death comes on the heels of a state audit into Vernon’s finances that was released on the same day Fresch was reported missing. In it, auditors noted that Fresch had failed to respond to repeated subpoenas for information. Last November Fresch announced his intention to resign, but he continued to work for the city as a paid consultant until May of this year. He was involved in many of the city’s biggest financial deals, especially those that involved Vernon’s Light and Power Department, including a once highly touted deal to purchase a 15-year prepaid supply of natural gas for the power plant that has since gone sour. At a recent Vernon City Council meeting, city officials admitted the purchase of the natural gas supply was a bad deal, noting that the value of natural gas had gone down significantly since they closed the deal. State auditors pointed out the city’s selling of a newly constructed power plant just two years after making the deal to purchase a 15-year supply of natural gas. A Vernon business owner, who has seen his electricity rates and cost of doing business go up in recent years, told city officials at the meeting, “If we were your stockholders, we would fire you.” Others threatened to move part of or all of their operations elsewhere. City officials once praised Fresch for his financial work with the city, but last week in response to the business community’s outrage at higher electricity rates and a proposed utility tax, they admitted that deals like the natural gas purchase have contributed to the city’s current financial mess. The shutdown of a San Diego nuclear power plant could lead to outages this summer, especially if the Southern California region experiences extreme weather or emergencies, say energy utility officials. Southern California Edison officials say events such as heat waves and wildfires could lead to both planned and unforeseen outages, especially now that the San Onofre Nuclear Power Plant has been shut down due to a leak detected earlier this year in one of its generating units. “We believe we have enough resources for this summer. However, if a power plant goes down somewhere else for whatever reason, or if a transmission line goes down somewhere, we could have issues on the system,” Southern California Edison spokesperson Veronica Gutierrez said. The 2,200-megawatt San Onofre Nuclear Power Plant generates 19 percent of the energy used by Southern California customers and helps keep the region’s energy supply stable. In January, plant operators detected a leak in one of the plant’s units, which they think is the result of vibrations that caused wear and tear not normally seen “this early in the life of the unit,” Gutierrez said. An immediate shutdown was ordered. Initial plans were to have the plant re-opened by the summer, but officials are estimating the plant will not be back online until late August. “We are still trying to figure out what happened there… safety is the most important thing, and safety has no timeline. We want to make sure we are bringing that plant back up only if we are satisfied and the NRC [Nuclear Regulatory Commission] is satisfied,” Gutierrez said. Officials could schedule brownouts, rotating them equally among the different areas in Southern California, but there could also be unexpected outages, especially at peak hours. “There are times during the day in the hot summer when the peak really strains the system… it’s the hottest period when we want people to conserve,” said Gutierrez. To prevent outages and to reduce the impact of the San Onofre plant shutdown, especially during the summer peak months, the utility is offering incentives and programs to encourage the public to conserve energy. And for their part, Southern California Edison is trying to make up for the loss of the San Onofre plant by bringing back online two old generating units in Huntington Beach, and speeding up the upgrade of a transmission line that will help facilitate energy availability in Orange County and San Diego, the areas most affected by the shutdown. However, the Huntington Beach units can only be kept online for a few months before they need to be shut down again. Customers are being urged to see this as an opportunity to reduce energy consumption costs by taking advantage of rebates and incentives for recycling old refrigerators, purchasing energy-saving refrigerators, changing out air conditioning units for more efficient ones; and upgrading swimming pool pumps. Also, by reducing energy use from 2pm-6pm on a “Save Power Day,” users can save up to $100 a year on their energy bill. Officials are also encouraging energy users to conserve energy on Flex Alert Days, which are issued by the state. There are also ways to better manage power usage through the utility’s new interactive online SmartConnect system, which displays statistics and data on how much energy you use, when it’s used, and what appliances or electronic equipment is sucking up the most energy. The system can help energy users keep track of and manage their energy consumption. Also, those who find out about the program incentives are encouraged to tell their relatives and friends who may not have access to the Internet or computers. In the event of outages, Edison officials are also issuing safety tips, especially in the wake of tragedies from the windstorm, in which three members of one family in San Bernardino were killed by a live power line that broke and crashed into their backyard. No matter what the line looks like, it is better to assume that it is alive, and to avoid touching them, officials said. They also recommend that those with medical conditions that require the use of air conditioning or other electronic equipment sign up to their “medical baseline” or “critical care” list so that scheduled brownouts will skip their homes or buildings. Hospitals or people with in-home medical equipment are also required to have backup generating devices in case of unexpected outages. For more information about the Southern California Edison incentives and programs, visit www.sce.com/SummerSave. A 14-lane-wide Long Beach (710) Freeway, including a trucks-only expressway perched between the freeway and the Los Angeles River, was proposed late last this week as a partial cure for the choking smog along the corridor of industry and commerce stretching between Los Angeles and the major ports near Long Beach. The environmental impact report is available online here. The public can submit written comments on the proposal until Aug. 29. The freeway-widening project is billed as a way to cut diesel emissions, including ozone and ultrafine particulates, in the low-income neighborhoods that line the freeway. Smog experts say particulates from trucks are the greatest contributor to local smog-related cancer risk, and university studies have shown the neighborhoods along the 710 Freeway corridor to be cancer and asthma hotspots. Caltrans and Metro officials released the proposal’s draft Environmental Impact Report for a 60-day public review period June 30. The $5 billion project would replace antiquated cloverleaf ramps and 60-year-old, substandard bridges, and modernize five freeway-to-freeway interchanges from East L.A. south to the Port of Long Beach. Impacted communities would also include Boyle Heights, the cities of Bell, Bell Gardens, Commerce, Vernon and South Gate, among others. About 200 homes and apartments would need to be torn down for the 14-lane-wide freeway/truckway combination, depending on final interchange designs, and nearly 200 businesses would also be ousted. Several parks and schools along the corridor, such as Bandini Elementary, could also be impacted, according to the report. In one of the alternatives, Vernon Fire Station No. 4 would have to be relocated. State planners say the 14 million truckloads coming and going from the ports of Los Angeles and Long Beach are expected to grow to 43 million per year in two decades, overloading the Alameda Corridor train tracks and other freeways and streets. 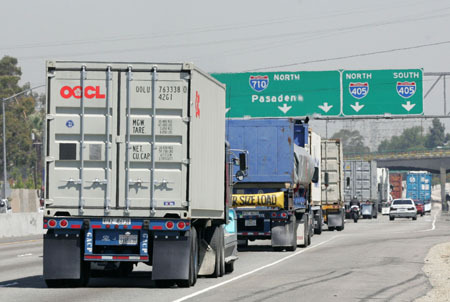 The new proposal calls for a four-lane trucks-only highway to be built north from Ocean Boulevard in Long Beach, wedged on the bank of the Los Angeles River next to the existing 710 Freeway. The truckway would fly over the avenues that bridge the existing freeway, and would extend as far north as Bandini Boulevard in the city of Commerce. Connections to the intermodal rail yards in Commerce and Vernon would be updated in the proposals. The existing 710, which is six lanes wide in Long Beach and eight lanes wide north of the 405 Freeway, would be completely rebuilt and widened in most places to 10 lanes wide. 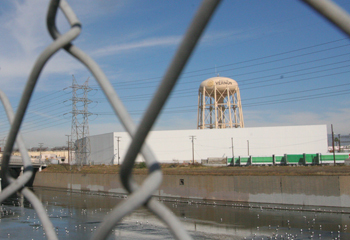 The existing 710 freeway’s center median would be shifted towards the riverbanks, onto land now occupied by massive electric transmission towers and some small farms, to spare hundreds of houses next to the freeway from demolition. Dozens of major steel towers would have to be relocated above the new freeway and truckway lanes, according to the study, and Los Angeles River levees would have to be moved or excavated in some places. One alternative being presented would limit access to the new truckway to electric trucks, operating with overhead poles and a new electric wire system on the truckway itself. The study notes that such trucks have never been built. The proposal also calls for modernizing 42 intersections along the 710, with both aesthetic and traffic signal improvements. A new interchange would be created at Slauson Avenue, but an existing set of ramps at Washington Boulevard might be removed under one option, to reduce conflicts with merging traffic at the Santa Ana (5) Freeway. It also calls for reconfiguration of the existing 5/710 interchange, where tricky left-hand exits dump hundreds of trucks into the 5 Freeway’s left lanes every day. The heavily used Washington exit is one of the direct routes to Commerce’s heavy industrial area. Commerce residents in the Bandini and Ayers neighborhoods, which are adjacent to the freeway, have long complained about the pollution caused by the trucks to the area. The damage to local streets, including Washington Boulevard, caused by heavy truck use, has long been an issue for area residents. EGPNews staff writers contributed to this story. Two-and-a-half months before President Obama signed the landmark Affordable Care Act, California State Assemblyman John Pérez had already introduced legislation proposing to implement one of the bill’s central components. Health care advocates describe the move as a sign the state was ready to forge ahead with providing affordable health care to its residents. While 26 states were busy challenging the ACA in state and federal courts, California has spent the last two years aggressively implementing—and taking advantage of—the legislation’s generous grants and subsidies. The state has already secured hundreds of millions of federal dollars from the legislation, including over $39 million for establishing a statewide health care exchange – a virtual marketplace where people can buy affordable health insurance. And legislators expect to receive around $15 billion annually to expand coverage to many of the nearly 20 percent of California residents who currently lack coverage. “You don’t want to govern based on the idea that policies are going to change,” Pérez’s press secretary, John Vigna, said in an interview last Thursday afternoon, adding that “partisan theatrics” aside, California legislators have been working on the assumption of the bill’s constitutionality. By upholding the Affordable Care Act, “we in California have been given a green light in validation of the work we have been doing to lay the groundwork for full implementation,” said California State Assemblyman Bill Monning Thursday afternoon in a teleconference organized by the California Endowment and Health Access, two prominent California health policy advocacy groups that celebrated the Supreme Court decision. Quick to implement the act, California remains among the worst states in the nation for people who are sick. Compared to other states, Californians are less likely to be insured or receive employer-based coverage and are at a greater risk of being denied coverage for pre-existing conditions, according to a press release from the California Endowment. This is particularly true for minorities, who are much less likely to have health insurance. “California has already taken critical steps to secure and expand access to health care for communities of color in California,” said Ellen Wu, executive director of the California Pan-Ethnic Health Network, in a press release applauding the court’s decision. About 60 percent of California’s uninsured are Latino, and of the nearly half million Californians who have gained coverage since the passage of the Affordable Care Act, over two-thirds come from communities of color. California’s early and aggressive adoption of the legislation was not without risks. Tough questions from the Supreme Court’s conservative justices caused many court observers and politicians to brace for a reversal. While the individual mandate was upheld, a majority of justices did find this central provision unconstitutional under the commerce clause, which was the administration’s legal rational for the measure. The Supreme Court’s ruling provides relief to hundreds of thousands of Californians who are already benefiting from the State’s implementation of the federal law. This includes an estimated 400,000 low-income residents who became eligible for Medi-Cal under the law and whose coverage could have been revoked if federal funding did not continue under the Affordable Care Act. “Today’s decision was a relief for the nearly half million Californians who are already getting coverage under the law,” said Anthony Wright, executive director of Health Access, who participated in the teleconference. The Supreme Court’s decision to strike down a provision of the Affordable Care Act that compelled states to expand coverage under the Medicaid program, the only part of the law that fell in Thursday’s ruling, will not affect California because it has already voluntarily chosen to expand coverage beyond the level mandated by the legislation. Wright minimized the importance of this part of the decision, citing the generous federal benefits offered to states in exchange for compliance. “I do think every state will take advantage of this deal,” he said. Even as health care advocates are rejoicing in the court’s decision, they are disappointed in Governor Jerry Brown’s decision to eliminate California’s popular Healthy Families program, an insurance program for low-income children. The axing of that program was a compromise with state Democrats intended to help close a $15.7 billion budget deficit. This decision was finalized June 27 late in the evening. But for many advocates, the Supreme Court victory overshadowed the state loss. New resources that will be available when major provisions of the Affordable Care Act go into effect in 2014 will make the loss of Healthy Families more manageable, Wright said. The state legislature has finally come up with a way to help homeowners who are facing foreclosure. On Monday, both the State Assembly and State Senate passed bills, SB900 and AB276, to help level the playing field between homeowners facing foreclosure and banks doing business in California. Probably one of the most important provisions contained in the new legislation is the prohibition against “dual tracking.” Under this provision, banks will no longer be allowed to continue negotiating loan modifications with homeowners, while at the same time pursing a foreclosure. Many homeowners who thought they were in the process of coming to a payment agreement with their lender, have had the rug unexpectedly pulled out from under them when they belatedly learned their home had been foreclosed on and sold at auction. Another important protection in the new law is the doing away of “robo signing,” which is the automatic signing of foreclosure documents by bank employees who in many cases have never read any of the paperwork that they are attesting to have reviewed. There are several other protections that will give homebuyers more clout when it comes to dealing with banks and other loan servicers. While it’s likely that there are some homeowners who are gaming the system, the reality is the gaming done by bankers and mortgage holders is what has led to the ongoing crisis in the housing market, and the significant loss in value to most people’s most important asset. We sincerely hope this new law will prevent future homebuyers from falling into the same housing quicksand, and banks from continuing down the path that got us here in the first place. President Obama and top Democrats have repeatedly exuded cautious confidence that the Supreme Court would uphold part or most of the Affordable Care Act. But beneath their strained optimism, the Obama administration almost certainly has known that politics, not law, will ram its way into the high court’s final decision. There was never much doubt that the health care reform law would face rough sledding from the court’s four ultra conservatives. The tip-off came quickly. The four justices’ hard line challenge to the government’s position during oral arguments signaled that they leaned heavily toward scrapping the law. The ostensible hook that the conservatives latched onto to assail the law was that the individual mandate is an unlawful infringement on individual liberty. It allegedly forces Americans to buy insurance. Nowhere does the U.S. Constitution confer that power on Congress or the executive branch. That’s just the start. Polls show that a slender majority of Americans want to dump all or parts of the law. This includes some Democrats. Despite loud protests that they are not swayed by public opinion or ideological beliefs, the court’s conservatives have shown they are as much “judicial activists” for their political views as they accuse liberal jurists of being. And the polls give even more ammunition to them. But even without the polls, the GOP and ultra conservatives waged their own very public and relentless war on health care reform from the moment Obama proposed it—even though the White House structured the legislation along line Republicans had advocated for years. The GOP claim it would be too costly, overburden business, would be unpopular with a majority of Americans, and would be an unwarranted infringement on the power of states to regulate health care. They also argued it would be too difficult for private insurers and health providers to offer it, price it and administer it. A decision to scrap the health care law—at least its key provisions–would be the political icing on the cake for a court that has done everything it could to tip the political scales back toward the GOP. The first nudge by the court under Chief Justice John Roberts was the Citizens United ruling. It virtually gives corporations and the super rich unrestricted license to pour any amount of money they see fit into political campaigns—and to do so anonymously. The conservatives made a preposterous twist of the 14th Amendment to confer individual rights and freedoms on business entities to justify the decision. The ruling was a clear reaction to the shock of the 2008 presidential campaign. The shock was that Obama and the Democrats, in a rare political victory, beat the GOP at its own fundraising game. It raised tens of millions, with a good chunk of that coming from Wall Street and wealthy donors. These are the donors who traditionally give lopsided amounts of money to Republican presidential candidate’s coffers—always, of course, hedging their bets with some contributions to Democrats. The Citizens United ruling was aimed at demolishing the campaign-fundraising field and insuring political campaigns in 2012 and the future would enable the GOP to reassert its financial supremacy. In the era when money not just dominates, but often buys elections, the side maintaining a top-heavy edge in funding will win elections outright or, at the very least, ensure its side will remain competitive. The Supreme Court conservatives continued their blatant political assault with last week’s ruling inKnox v. SEIU case. Even though two of the court’s liberal justices joined the conservatives in siding with Dianne Knox and other California workers who sued the Service Employees International Union, the more progressive justices said the rightist majority had gone too far. Like many workers, Knox and her co-plaintiffs were not members of the union, but were represented by SEIU because they benefit under union-negotiated contracts, such as by receiving better wages and benefits. Such workers don’t have to join, but are assessed dues, except in so-called right-to-work states, because they benefit from the union’s negotiations. A New York Times editorial Saturday stated that “the conservative majority strode into the center of the bitter debate about right-to-work laws” and issue of collective bargaining that have been so contentious in Wisconsin and other states. The decision virtually mandates that unions can’t collect dues from nonunion members even when the unions are fighting for wage and job-protection rights that affect those not in the unions. The ruling ostensibly upholds individual liberty. But the result is that it will severely cripple public employee union’s ability to raise monies necessary to vigorously fight for labor protections. The decision gives a legal cover to GOP governors to further sledgehammer public employee unions in their states. Next up is affirmative action. Expect the court to use the suit by a former Texas white student against the University of Texas’s modest affirmative-action program to once and for all dump affirmative action out of education. This will have a ripple effect throughout all government and even corporate affirmative action programs. The court’s sharp upturn in the sheer number of conservative decisions tells the real story of the majority’s naked political activism. In the first five years under the watch of Chief Justice Roberts, the court issued conservative decisions in nearly 60 percent of the cases, an unusually large number of them by a 5-4 split. And in the term that ended the year after Obama took office in 2009, the percentage of conservative decisions shot up to 65 percent. This is the largest number of overtly conservative political decisions in over a half-century. There’s no sign that that the court’s conservative rampage will change. The health care reform law, if it is overturned, would be the court conservative’s political coup de grace. It would come in the heat of what will be an intensely close White House race and will earmark yet another big political gift to the GOP. With that and its other decisions, it has done everything it could to bend the law for its blatant political ends. As a physician, I find it very odd that the debate over the Affordable Care Act has focused on the effect the law will have on the presidential election rather than the impact it will have on patients, health professionals, and health outcomes. The Supreme Court case reinvigorated the debate over the Obama administration’s 2010 health care reform law. But we’re still getting partisan talking points instead of an honest review of the changes that are in store. This will likely worsen as we get closer to Election Day. The new law is based on concepts developed by the Heritage Foundation, a conservative think tank. Republican presidential candidate Mitt Romney passed a very similar law for his state when he was the governor of Massachusetts. So while most Democrats are celebrating the Supreme Court decision to uphold the Affordable Care Act and Romney is saying he’d repeal it, consider this: Had a Republican passed this federal law, we would have the opposite situation. Let’s put politics aside and look at the law from a policy standpoint. The big winners of the Supreme Court decision are the corporations who are profiting from the current health system — private health insurers, pharmaceutical companies, and corporate-owned hospitals and medical practices. The Court has deemed it constitutional for the government to require people to spend up to 9 percent of their income to purchase private insurance despite it being a defective product. People with insurance continue to face financial barriers to care. They delay and avoid necessary care because of the cost of co-pays and deductibles. When patients have a serious medical condition, they risk financial ruin. Illness and soaring medical costs are the greatest causes of bankruptcy in the United States, even though four out of five people experiencing medical bankruptcy have health insurance. Purchasing private insurance is going to be subsidized with taxpayer dollars. It will cost Uncle Sam an estimated half a trillion dollars between 2014 and 2019 to pay that tab, according to the Congressional Budget Office. The insurance mandate and these subsidies will create corporate welfare on steroids. What will the insurance companies do with all that money? They’ll hold onto as much as they can by denying and restricting payment for care. And they’ll use those dollars to weaken regulations meant to protect patients. When national health care reform is fully implemented in 2019, 26 million people will still lack coverage. And health costs will continue to rise because the law lacks proven cost controls. While the law does include a few positive provisions, it won’t stop the deterioration of our health care system. We’ll continue to see unnecessary suffering and preventable death. This is unacceptable when we are already spending nearly twice as much per person on care each year as other industrialized nations with universal health systems and much better health outcomes. The truth is that we can solve our health care crisis. The fastest way to accomplish this is to drop just two words from the Medicare Act — “over 65” — and immediately expand Medicare to every person. That would create a system that’s about health care, not corporate profits. 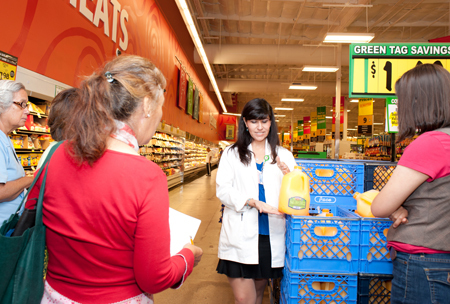 A universal Medicare system would control costs and improve the quality of patient care. Let’s demand Medicare for all now. The longer we wait, the more people will suffer and die needlessly. Margaret Flowers, MD is a pediatrician from Baltimore and co-director of ItsOurEconomy.US. Distributed via OtherWords.org. 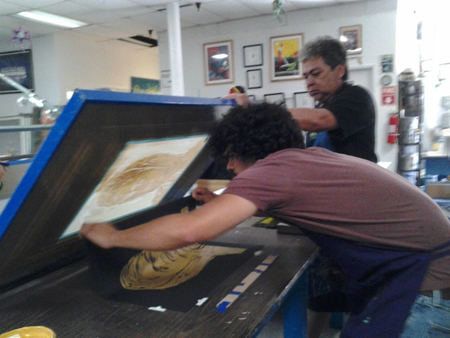 A little over a year after the eastside non-profit arts institution moved to Boyle Heights, Self Help Graphics & Art is doing what it has never done since it’s birth in 1973; aggressively seeking grants and partnerships to continue it’s mission of developing and nurturing Latino artists in printmaking. The change was born out of necessity. Self Help Graphics moved from its location on East Cesar Chavez in East Los Angeles in March 2011, when their building was sold by the Los Angeles Catholic Archdiocese on behalf of the order of nuns that had allowed them to stay there rent-free for more than four decades. The new site in Boyle Heights, offering the same amount of space, was affordable, explains Evonne J. Gallardo, the art institution’s executive director. They initially shared the space with another tenant, but are now the sole occupants. They are now conveniently located across the street from the Pico/Aliso Metro Gold Line Station, which makes them easy to get to. 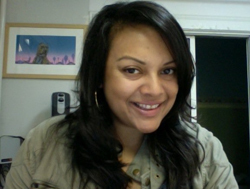 Gallardo joined Self Help about three years ago and says she is using her background in non-profit development to propel the center toward a more financially secure future. EGP interviewed Gallardo about Self Help’s recent annual, one-day print fair on June 24, and the organization’s progress. EGP: How did the print fair go? Gallardo: The print fair was a great success. Close to a thousand people came by throughout the day. Though we are still tallying up the results, we made about $25,000. EGP: How does that compare to previous years? Gallardo: We have certainly done better in previous years. It’s a reflection of the economic challenges our community and Los Angeles is facing. Sometimes when people think about art, it’s something they won’t normally buy, but our prices are more competitive than ever… Certainly our prices are low for the type of prints and quality of art, the prices triple if you go to the Westside and Santa Monica area to buy prints. EGP: What was the highlight of this year’s print fair and exhibit? Gallardo: The new works that premiered for the fair, two ateliers by 10 artists. One was the “The Jornalero Papers,” the other was “Sueños Libres: West Coast Soñasos.” The first addressed the life of jornaleros who themselves were or are day laborers. The other atelier envisioned fictional album covers of imaginary music groups, all in the medium of silkscreen print. Five of the ten featured artists are from Los Angeles, the other five were from other parts of the country. The ateliers were funded in part by National Endowment for the Arts, and the Pasadena Art Alliance, as well as our collectors and donors. EGP: I got the impression the T-shirts were top selling items, is that correct? Gallardo: Yes. So, to us it doesn’t matter what the art goes on. It is still a piece of art. The process of silk-screening a T-shirt, we are able to do that at more accessible prices, like $10 to $20. We love to see people walking around with artists’ designs, or the Self Help Graphics logo, on their shirts. It’s beautiful work and great marketing. What makes coming to Self Help Graphics so special is that you get to meet the artists, and that’s what makes the art more valuable. EGP: So how is Self Help Graphics doing now? Your print sale flyer says you have several foundation grants. Gallardo: Since I joined the organization, three years ago now, I’ve put a lot of time and hard work into creating the funding relationships Self Help Graphics hasn’t had … It’s an ongoing effort to keep doing what we do, so we can keep serving our mission. We have wonderful partners and donors and we appreciate them, but we still need to hold the print sale and sell T-shirts to keep the organization healthy and growing. Certainly, we have a real need for the grants we rely on, but we also have a greater need for the community to continue to support us through contributions and art purchases. EGP: What’s next for Self Help Graphics? Gallardo: For over a year, we made the space, as it exists, work for our operations and programming with the help of Councilmember Jose Huizar and his staff. During the next 12 months, we are embarking on lease-hold improvements that will make things even better. We are re-working the space, and studio layout, putting in some skylight windows, and improving the air conditioning. In print production, temperature is very important. We are also doing all new electrical, and improving access to outlets.